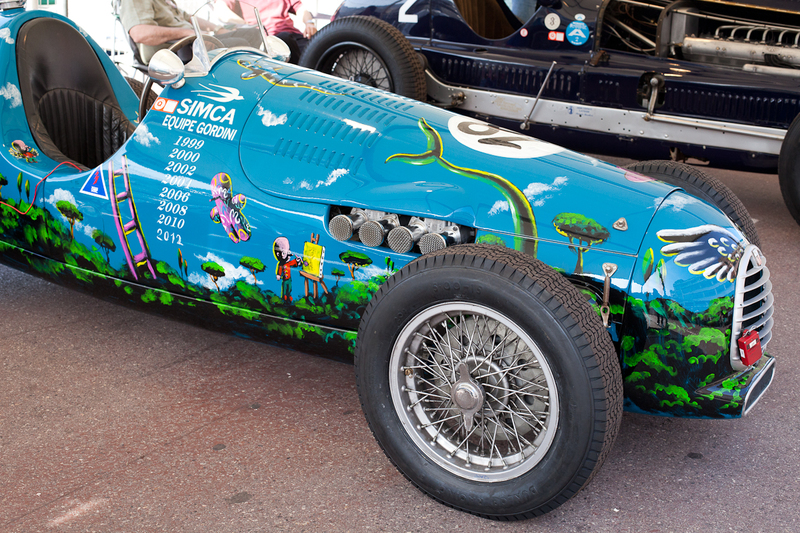 This decorated car is a Gordini T11/15 built in 1947. Seems a sacrilege to me that a beautiful old racing car should be painted like this but perhaps other people don't agree. It certainly stopped me in my tracks! 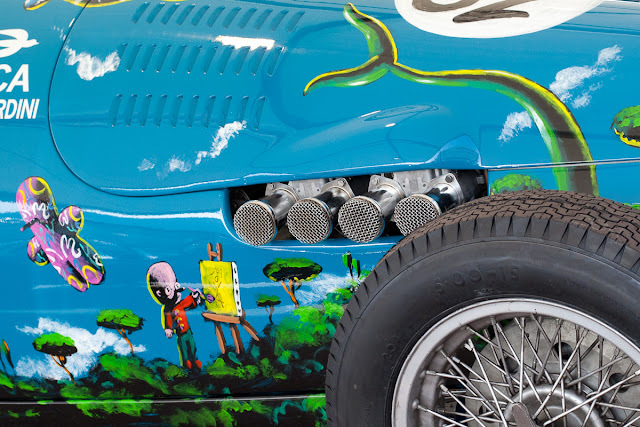 This actually looks great, and proves that there is at least one owner who has the .. courage .. to put contempory art on an old car. Most are soooo concerned to leave everything as is - and make the thing run with rose kitchen towels- ROFL!! Is it real paint? Nowadays people just print graphics onto special thin vinyl wrap that adheres to the car but can be pulled off easily. For ex., none of the logos on F1 cars are hand-painted any more. Not sure if I like it or not, but can see the appeal of making a unique car. Although I don't suppose there are that many around anyway. Oh. I agree with you. If a thing is beautiful in and of itself, why tinker? Ed, you make a good point although I am pretty sure this is a real paint job. If you click on the photo it should enlarge for you to see more detail. As a known artist did the work I can't imagine he'd paint onto thin vinyl - but really I haven't a clue. Next time I'll look more carefully. I've seen recent pics of Patrick Moya doing the work himself for this automobile. I had the privilege of meeting with him last September and got a tour of his work in Cannes at the time. Great guy, fantastic sense of humor, he has the best outlook on life! Jameson, well that settles the discussion then on paint v stuck on - and a lovely tribute from you to the artist. thanks for another great series, Jilly ... now looking forward to your 2012 F1 series.